Stefan Kottwitz, LaTeX Beginner’s Guide. Packt Publishing Birmingham-Mumbai, 2011. 314 pp. Paperback, US$44.99. To tell the truth, I was rather skeptical when I agreed to review this book. 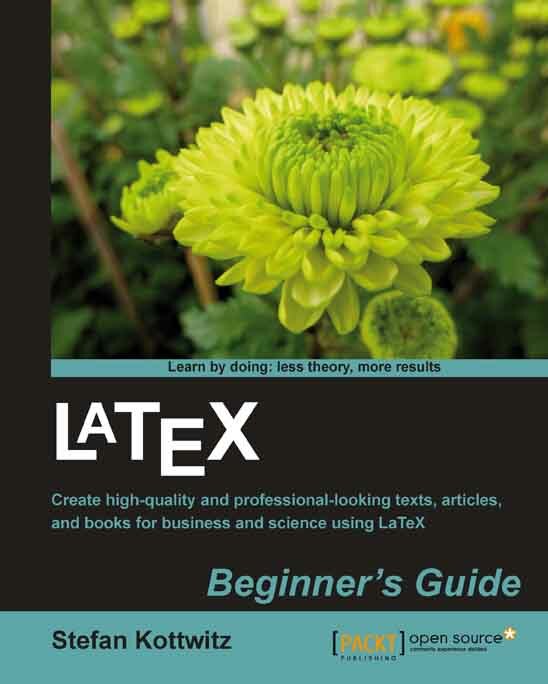 There are already good guides for LaTeX beginners, including the book by the author of the language , the excellent introduction , the popular free course , the mathematics-oriented books [1, 2] and many, many others. How can yet another introductory LaTeX book be different? I was completely wrong. The new book by Stefan Kottwitz is very much unlike other introductory LaTeX courses. The author, evidently, wanted to make a LaTeX book for the new generation—the generation of Twitter and mobile devices. The book’s advantages and disadvantages stem from this. First, the contents. Besides the topics one would expect from any introductory LaTeX book—LaTeX commands, document structure, logical markup etc.—the guide by Kottwitz includes also items traditionally omitted from beginners’ books. For example, it explains how to install a TeX system. Usually this has been considered a feat reserved for computer gurus (the manual  contains references to a Local Guide presumably written by one of these lofty sages). The TeX Live system makes installation much simpler, and this book helps a novice to understand the necessary steps. LaTeX Beginner’s Guide discusses dozens of packages and spends considerable time in explaining their usage in customization of the documents—another topic traditionally relegated to more advanced users. Many of the items discussed in the book are “modern” in the sense that they became possible or popular in the last decade: getting the full advantage of pdfetex features with the microtype package, employing many fonts besides the traditional ones, using Unicode and Latin Modern fonts for European languages, adjusting page dimensions, creating hyperlinks, and a number of other interesting and relevant topics, which are not well covered in other introductory texts. Stefan Kottwitz has been a moderator for several online support forums. This gave him a good understanding of what is important for the modern users. The selection of topics is perhaps the strongest side of the LaTeX Beginner’s Guide. Second, the way this book explains these topics is notably different from the style of many other LaTeX books. It is a part of the series of Beginner’s Guides from Packt Publishers. The series is based on the hands-on approach. Its slogan is Learn by doing—start working right away; the books shun “boring bits” of theory for practical recipes and examples. Accordingly, this book has a huge number of well annotated code snippets and exercises. An impatient reader who wants to get something here and now will be thrilled by this book. On the other hand, sometimes this refusal to deal with the theory makes the explanations rather superficial, for example, the treatment of the familiar problem of \footnote inside a \section argument on page 100. Although to be fair, the explanations of this problem in other introductory texts are also more or less handwaving. The style of the book is rather “chunky”. A topic takes a half page or a page, then comes another topic, then another one. In this way the author covers a large volume of material, but it gives a “Twitter-like” look and feel to the book. Another decision of the author, to use “cool” slang, seems to be rather controversial. The examples in the book are subtitled Time for action, the suggestions for independent work are put under the heading Have a go hero, and all the quizzes are, of course, Pop quizzes. Evidently the reader should imagine himself or herself a mighty hero, involved in a lot of action, from time to time interrupted by a short quiz. The typography of the book is also quite different from the typography of most other books about TeX. Some people (especially outside of the USA) consider the default styles of LaTeX to be “too loud”. They should open Kottwitz’s book with a certain caution: it may give them a heart attack. The book designer used for emphasis and headers the following: (a) margin changes with and without icons and square brackets on the margins; (b) fake crop marks; (c) boxes with shadows; (d) really huge fonts; (e) heavy bold fonts; (f) reverse video (white on black); (g) combinations of the above (like huge heavy bold fonts in reverse video). Even folios (page numbers) of this book are boldfaced and in bold square brackets. The typography of this book does not hide like classical typography does: it jumps at you with all the subtlety of a ransom note. Still, I admit it would be very difficult to find a more subdued typography style corresponding to the “chunky” character of the book. The text itself has these abrupt changes of topics, like PowerPoint (or should I say beamer?) slides. It might be argued that prominent typesetting devices are necessary to present this text. Also, the use of these devices is quite consistent throughout the book. Moreover, the designer made a good judgement that traditional justified text with a serifed font would not work with this style of headings and emphasis. Thus the choice of ragged right paragraphs with a sans serif body font seems to be a good call. Still, it is somewhat strange when the author talks about justification and uniform grayness of the pages, when his own book presents anything but. While the typography of the book may have a certain merit, the illustrations are just plainly bad. The book has many examples of typesetting presented as magnified fragments of TeX output. They all look like low resolution screen captures obtained by pressing the PrintScreen button. These fragments are unbearably ugly and do not even begin to show the beauty of TeX documents. There are many ways to get high resolution TeX output at large magnification. The author and editor should have used one of them. it is well written and is understandable for a novice. This book can be a basis of a crash course in LaTeX or as a self study tool—as long as the student does not use it as an example of the typographic art. Final note: the publisher is offering a discount to TUG members who want to buy the book (in print or electronic form). The discount code is given in the TUG members’ area: https://www.tug.org/members. Helmut Kopka and Patrick W. Daly. Guide to LaTeX: Tools and Techniques for Computer Typesetting. Addison-Wesley, Boston, fourth edition, 2003. Leslie Lamport. LaTeX: A Document Preparation System. Addison-Wesley Publishing Company, Reading, Mass., second edition, 1994. Illustrations by Duane Bibby. Tobias Oetiker, Hubert Partl, Irene Hyna, and Elisabeth Schlegl. The Not So Short Introduction to LaTeXe, Or LaTeXe in 174 Minutes, April 2011. http://mirrors.ctan.org/info/lshort.